Bobbie Nell Carter Jennings entered her heavenly home on December 9, 2017. She was a beloved wife, mother, "Mamaw" and great-grandmother. Her warm smile, friendly personality and gift of encouragement will be greatly missed by all who knew her. 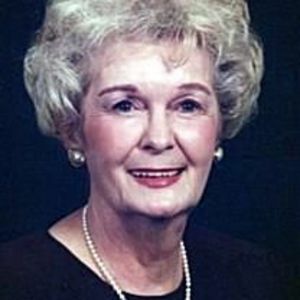 "Bobbie Nell," as she was affectionately known, was born in Wheeler, MS, on February 25, 1930. She was a graduate of Wheeler High School and Blue Mountain College (1952). In 1953, she married her loving and devoted husband of over 64 years, John William ("J.W.") Jennings of Booneville, MS.
During the early years of their marriage, Bobbie and J.W. lived in Georgia (Rossville and Chatsworth). In 1962 they moved to Brandon, MS, where they raised their family. In 1998, they returned to Booneville, MS, for retirement. They were blessed with loving and caring friends in each locale. Bobbie taught freshman high school English and literature for over 19 years, primarily instructing students at Brandon High School. Her students always knew that she genuinely cared for them, and over the years, many have expressed appreciation for her tutelage. She was a former member of Daughters of the American Revolution, Mississippi Retired Teachers Association, and the Mississippi Federation of Women's Club, Inc. Bobbie will also forever be remembered for her gifts of cooking and hospitality which she shared with so many. Bobbie was passionate about her faith in Jesus Christ. She read her Bible daily, even during most of her "forgetful" years. She was a member of First Baptist Church Booneville. Over the course of her life, Bobbie taught ladies' Sunday School classes and Vacation Bible School and was involved in choir, WMU and the Joymaker's Club. Bobbie was predeceased by her parents, Mr. and Mrs. Robert O. Carter; R. Horace Carter (brother), Sidney C. Carter (brother), and Drue Carter Tyson (sister). She is survived by her husband J.W. Jennings of Booneville, MS; daughters Joy Jennings Lurate (Yerger) of Madison, MS, and Kathy Jennings Brent (Joey) of Hattiesburg, MS; grandchildren Lindsey Brent McClemore (Brent), Preston A. Brent, and William Y. "Will" Lurate; great-grandchildren Felicity and Tessa McLemore; brother George Max Carter (Katherine) of Woodland Park, CO; and a host of nieces and nephews. In lieu of flowers, donations made be made to First Baptist Church Booneville or to Blue Mountain College.